As we approach 2005, I think it would be good for this blog to have a clearer sense of purpose and direction. This is why I spent a good part of today trying to compose a theme song for the blog. I'll try to explain it as best I can but essentially it's an octopus with Valkyrie braids and helmet, except that the helmet is more squidlike rather than horned. Here is an octopus that goes around kidnapping squids and skinning them, but not before chanting "It puts the lotion on its skin". Very Silence of the Lambs isn't it? Oh, and it also has the eyebrows of Martin Scorcese. Eight perfectly formed appendages. Count them. I've saved its best feature for last. Valkyrie octopii with squid headgear are a dime a dozen but what really set it apart from its peers was its orifice. 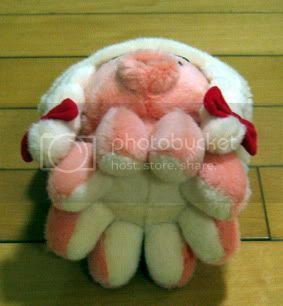 It has already become very popular with all the other soft toys in my collection. Now all I need is a name to christen this fascinating creature from the depths. This is where you come in. I really need help. Your help. Blog of the day: Wanbro is nominated in the best Mainland China blog category of the Asia Blog Awards. 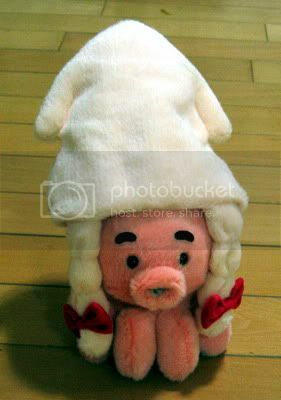 I'm feeling great pity for your mascot... How many other soft toys are there in your collection?? Squidhilda? Heidi of the Sea? Octokissy? Monica Lewinsky? I'll stop there. Perhaps a viking name might be suitable, the braids and squid helmet looked so viking like at first glance. Besides Valkyries are part of viking legions too, so how about - Stumi? Else u can look thru this list here too. Thanks I like them all. Don't stop! Eight appendages and one orifice.... the possibilities are endless.